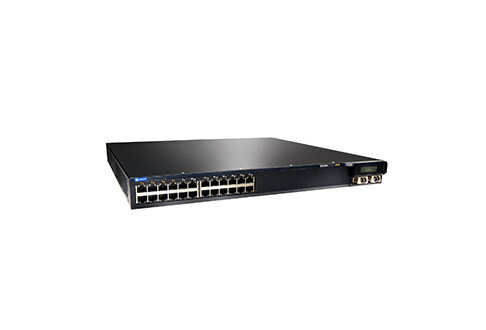 In today’s business environment demanding high-performance networks optimized for speed, reliability and security in application delivery, Worldwide Supply’s pre-owned Juniper switches deliver. Our refurbished Juniper networks and switches offer regional offices to global firms the ability to support a variety of media (e.g., telephony, video conferencing, web services, etc.) on a single IP infrastructure protected from attack by integrated security functions. Performing better than new (0.5% failure rate) at 50%-90% savings below OEM costs, Worldwide Supply’s pre-owned Juniper Ethernet switches offer the performance and price to meet your network and budget needs. Worldwide Supply’s pre-owned Juniper switches deliver the performance, wire-speed port densities, and scalability that today’s networks demand. Offering uninterrupted delivery, unified communications, integrated security functions, and high availability (HA), the Juniper switch series enables operational excellence for today’s and tomorrow’s network needs. Thoroughly tested by our Quality Management Teams in rigorous real-world test protocols and environments, Worldwide Supply’s refurbished Juniper switches perform better than new at 0.5% failure rates compared to the industry average of 3%-5%. Offering savings of 50%-90% compared to OEM costs, Worldwide Supply’s pre-owned switches deliver the performance you need at a cost you can afford. Protect your network. Extend equipment life. Today’s IT managers are challenged to meet increased network performance expectations and load requirements in an environment of legacy network enterprises and tight budgets. Worldwide Supply’s pre-owned Juniper Ethernet switches coupled with our NetSure® monitoring and maintenance solution enable you to maximize your network performance, extend your equipment life, and reduce your risk without high OEM maintenance costs. Protect your switches and extend your equipment life with NetSure® solutions’ multi-vendor and multi-generation support (EOL and EOS), real-time monitoring, flexible contracts, modular pricing, and proactive provisioning (onsite spare or next business day delivery). Keep your network up and running. No enterprise can afford network delays or downtime. With 200+ million in inventory and global operations in the U.S., the Netherlands, and Singapore, we offer the Juniper switches you need, when you need them. As one of the first to offer pre-owned Juniper equipment and carrying the largest selection of pre-owned Juniper equipment in the industry, Worldwide Supply offers network monitoring (NetSure®), overnight delivery, and 24 x 7 x 365 expert technical support to fulfill your equipment orders and keep your systems up and running.